Would you put your baby or toddler outside in the freezing cold for their lunchtime nap? Most Nordic parents wouldn’t give it a second thought. For them it’s part of their daily routine. Daytime temperatures this winter in Stockholm have regularly dropped to -5C (23F) but it’s still common to see children left outside by their parents for a sleep in the pram. Wander through the snowy city and you’ll see buggies lined up outside coffee shops while parents sip on lattes inside. “I think it’s good for them to be in the fresh air as soon as possible,” says Lisa Mardon, a mother-of-three from Stockholm, who works for a food distribution company. This isn’t a recent fashion. Lisa’s mother, Gunilla, now 61, says she also did it with Lisa when she was a baby. “Yes we were doing it back then as well… It was important for her to get fresh air and stay healthy,” Gunilla says. And Lisa’s father, Peter, was put outside by his mother to sleep in a pram in the 1950s. Only when it got to around -10C (14F) did she bring him indoors. Nowadays most day-care centres in Sweden put children outside to rest. It’s common to see rows of prams lined up in the snow at nap-time, with youngsters fast asleep inside. 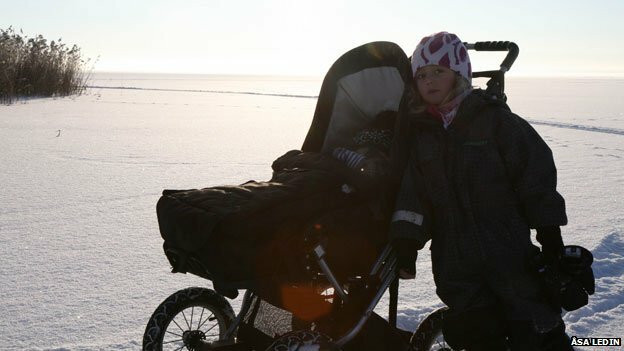 “When the temperature drops to -15C (5F) we always cover the prams with blankets,” says head teacher Brittmarie Carlzon. “It’s not only the temperature that matters, it’s also how cold it feels. Some days it can be -15C but it actually feels like -20C (-4F) because of the wind,” she says. The theory behind outdoor napping is that children exposed to fresh air, whether in summer or the depths of winter, are less likely to catch coughs and colds – and that spending a whole day in one room with 30 other children does them no good at all. Many parents also believe their children sleep better and for longer in the open, and one researcher in Finland – outdoor napping is popular in all the Nordic countries – says she has evidence from a survey of parents to back this up. “Babies clearly slept longer outdoors than indoors,” says Marjo Tourula. While indoor naps lasted between one and two hours, outdoor naps lasted from 1.5 to three hours. “Probably the restriction of movements by clothing could increase the length of sleep, and a cold environment makes swaddling possible without overheating,” she says. 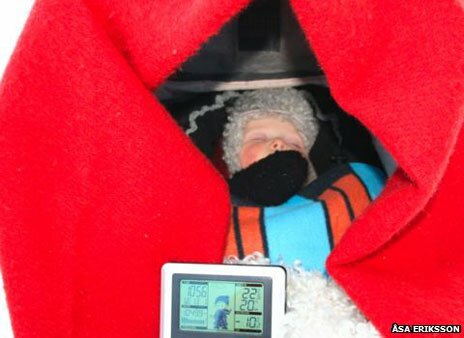 According to her research, -5C is the best temperature for an outdoor nap – though some parents she spoke to even put their children out at -30C. “In some studies they found pre-schoolers who spent many hours outside generally – not just for naps – took fewer days off than those who spent most of their time indoors,” she says. “It’s very important that the children have wool closest to their body, warm clothes and a warm sleeping bag,” he says.